GO UNDERCOVER WITH A HUMAN ELEMENT! Catch behind the scenes character interviews, the inspiration, location, excerpts, and more! “Donna must have picked up on my weakness for Dean Koontz, because A HUMAN ELEMENT echoes the bestselling author in terms of creativity, the supernatural and overall dark allure. Add in a little paranormal romance and you’ve got one delicious literary paranormal mashup.” – Blog for the Paranormal & Mystical Minds. See full review. “A thrilling ride full of believable characters, a terrifying villain, an epic battle for survival, and a love worth killing for. The last third of the novel is a race to the finish, and I was glued to the pages, hoping the characters I’d grown to love would finally find the peace they deserved. A page-turner filled with fascinating twists and turns!” – Marie Lamba, Author of WHAT I MEANT and DRAWN. See full review. “A fast-paced paranormal suspense thriller that will keep you engrossed as you turn the pages. The characters are realistic, their complex individual personalities and stories add a powerful and compelling depth to the story. It is a story that will have the reader pondering about supernatural powers and the evil forces of humanity, this suspenseful tale will stay with you long after you have read the last word.” – Jersey Girl Book Reviews. See full review. 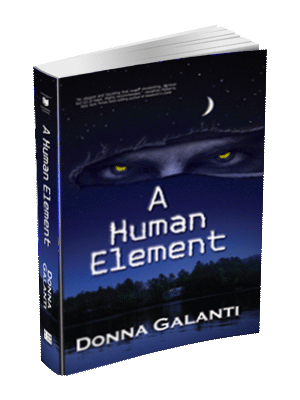 “Donna Galanti has created a thriller with a huge, aching heart. Her main characters, Ben and Laura are conjured in delicious detail, as are their personal trials. Galanti’s rich and provocative thriller asks big questions. What makes us human, what makes us monstrous? Is there a love that can transcend the physical and emotional, to the supernatural? Galanti has given us an impressive debut. With her blending of romance, the coming of age quest, and the supernatural, she is a writer to watch, who will surely expand the diameters of the thriller genre.” – Catherine Stine, Author of FIRESEED ONE. See full review. “Twisted family and government cover-ups lead to vendettas that last a lifetime, change and growth as a person and righting the paths once taken in vain all come around to grab you as the climactic ending brings everything full circle. As the romance picks up and bonds are formed A HUMAN ELEMENT brings everything it has into one massive emotional punch.” – I Smell Sheep Blog. See full review. “Absolutely one of my favorite books in a long while. This book has it all, and Galanti is a master story teller. Galanti does a great job at not only telling a fantastic story, but really drawing us into the various plot lines and feeling for the characters as they each battle their own demons. The pace is perfect and natural as breathing. It kept me coming back to see what happened next. I’m a sucker for a tragic character and the evil antagonist is perfectly tragic. Definitely going on my GoodReads ‘Favorites’ Shelf!” –Tracy Riva Book Reviews. See full review. 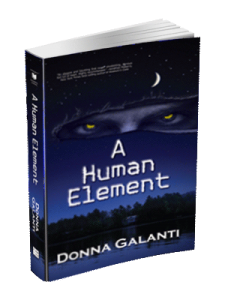 “A HUMAN ELEMENT is a good read for young adults and adults alike. It’s about family, friendship, forgiveness, and the faith that everything will be all right in the end…. after a creepy game of hide-and-seek, that is. A balanced mix between a thrilling chase and the warmth of a love story.” – Eat Ur Banana Blog. See full review.